A few weeks ago we met up with Ryan Powers, Jonathan Schuster and Kevin Marshall from Clarity Consulting to talk about a project they've been working on called Facebook Developer Toolkit. The initial project was a collaboration with the Microsoft Visual Studio Express team in Redmond and is now an open source project hosted on CodePlex. If you're a .NET developer and want to start building applications for the Facebook platform, you definitely need to check out the Facebook Developer Toolkit. If you'd like to contribute to the project, head on over to the Facebook Developer Toolkit Project Page. Also, be sure to listen to the show for a chance to win a custom 80GB Zune from Zune Originals. 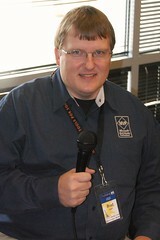 Larry is speaking at the Indianapolis .NET Developers Association on January 10th. Sleepless in Chicago is coming the weekend of February 1st. Larry will be attending MIX'08 in Vegas. Dave will be attending South by Southwest. Ryan's article on Silverlight 1.1 on Facebook Canvas Page using ASP.NET and Facebook Developer Toolkit. For this episode, we sat down with Gerry Heidenreich and Damon Payne in Milwaukee, WI to discuss Project Euler. Project Euler is named after Leonhard Euler, who was a mathematician in the 1700's. Gerry and Damon spend some of their free time solving mathematical problems on the Project Euler site. You can read Gerry's blog at http://edsid.com/blog/ and Damon's Blog at http://damonpayne.com.